Founder of the family; lived in the sixteenth and seventeenth centuries. He was the author of a work entitled "Ḳiẓẓur Hilkot Sheḥiṭah u-Bediḳah," a compendium of the laws on the slaughtering of animals (unpublished). Grandson of Benzion Ghirondi (Ẓarfati); born at Cittadella, a village near Padua, Dec. 27, 1763; died at Padua Dec. 21, 1815. He was the author of a volume containing homilies, poems, and exegetical notes on the Bible (unpublished). Author and chief rabbi of Padua; born in Padua Oct., 1799; died there Jan. 4, 1852. Ghirondi studied at the rabbinical college of Padua, in which he was appointed professor of theology (1824). In 1829 he was appointed assistant rabbi of Padua; two years later he became chief rabbi. He was a recognized authority in rabbinics, and was consulted by rabbis of several communities. He wrote: "Toko Raẓuf Ahabah," a work on ethics produced when he was only sixteen years old (Pisa, 1818); "Ma'amar Keriyyat ha-Borot," a treatise on artesian wells, showing references to them in the Talmud (printed in I. S. Reggio's "Iggerot Yosher," Vienna, 1834). But his most important work is "Toledot Gedole Yisrael," a biographical and bibliographical dictionary of Italian rabbis and secular scholars. He had in his possession Nepi's biographical work entitled "Zeker Ẓaddiḳim"; to this he added 831 numbers of his own, two-thirds of which are not found in any earlier biographical dictionary. 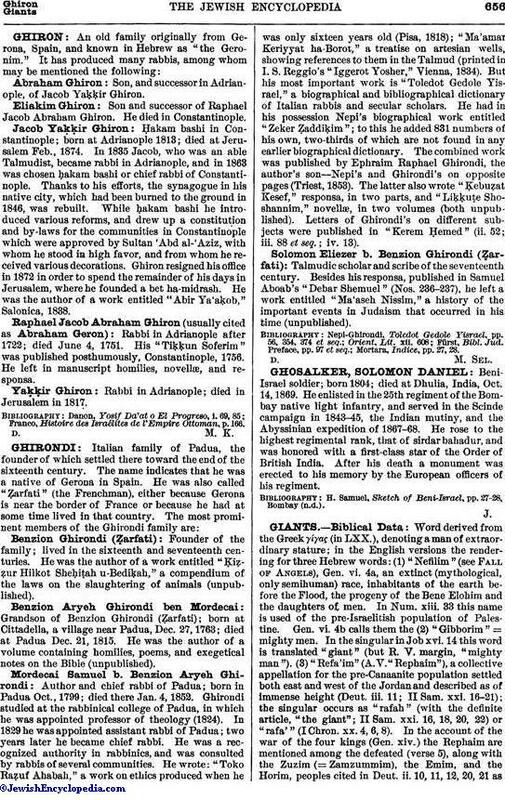 The combined work was published by Ephraim Raphael Ghirondi, the author's son—Nepi's and Ghirondi's on opposite pages (Triest, 1853). The latter also wrote "Ḳebuẓat Kesef," responsa, in two parts, and "Liḳḳuṭe Shoshannim," novellæ, in two volumes (both unpublished). Letters of Ghirondi's on different subjects were published in "Kerem Ḥemed" (ii. 52; iii. 88 et seq. ; iv. 13). Talmudic scholar and scribe of the seventeenth century. Besides his responsa, published in Samuel Aboab's "Debar Shemuel" (Nos. 236-237), he left a work entitled "Ma'aseh Nissim," a history of the important events in Judaism that occurred in his time (unpublished). Mortara, Indice, pp. 27, 28.